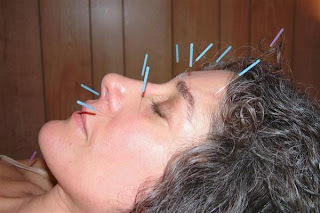 Acupuncture is a science that requires very precise placement of needles in specific parts of the body. How would you feel about a blind acupuncture practitioner? Juliana Cumbo is a 31 year old graduate intern at the Academy of Oriental Medicine in Austin, Texas. She holds a master's degree in acupuncture and has passed the national board exams. However, her first application for a license to practice acupuncture in Texas was turned down by the licensure committee. Cumbo has recently applied a second time. The committee chairwoman, Meng-sheng Lin, said that she would probably vote against granting Cumbo a license. She noted that sometimes acupuncture causes bleeding that can cause a contamination risk. Cumbo's attorney, David Cohen, says that failing to license Cumbo on the basis of her blindness is a violation of the Americans with Disabilities Act. anyone feel like a game of "pin the tail on the donkey?"